Rogueport Sewers is a huge chain of rooms under Rogueport that contain the Thousand-Year Door, various Warp Pipes, and the Pit of 100 Trials. There is a hidden town here with a shop that sells rare items such as Ultra Shrooms and Gold Bars. Hidden in the sewers is a Teleporter that the X-Nauts used to teleport from X-Naut HQ to Rogueport. There is also a badge seller named Dazzle. The main way of getting into the sewers is a pipe in front of Professor Frankly's house. Another way in is West Rogueport's sewer grate. Special Blue Pipes leading to Petalburg, The Great Tree, Keelhaul Key, Poshley Heights and Fahr Outpost can be found in the sewers. Regular portals to particular regions include a stone warp pipe to Petal Meadows, two wooden pipes: one to Boggly Woods and one to Twilight Town, although the one to Boggly Woods is monochrome like the rest of the woods and the one to Twilight Town is brown with exaggerated shadows, and a blue warp pipe is used to gain access to Fahr Outpost. The Teleporter is the fourth portal found in Rogueport Sewers and is used to reach the X-Naut Fortress and through that, the Moon after Mario is fired out of the cannon, as it is impossible to be fired again. 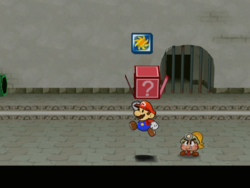 When Mario reaches the bottom floor of the sewers for the first time, he has to learn a new paper ability to reach the door from the first Black Chest Demon inside a black chest. After Mario reaches the Thousand-Year Door, he has to stand on the pedestal and hold up the map. The map shows him the location of one of the Crystal Stars. This process is repeated after every Crystal Star Mario gathers. A Squeek can be found here, looking for her lost partner while researching the depths of Rogueport Sewers. A few houses in the background can be entered by special warp pipes. As seen in one of the final cutscenes, the Thousand Year Door in the Rogueport Sewers is directly below the gallows in Rogueport Square. Logically, the fountain in the ruins of the old town is located directly between the two as well. The Rogueport Sewers is to Paper Mario: The Thousand-Year Door as Toad Town Tunnels is to Paper Mario. The spike room is nearly identical to a room in Tubba Blubba's Castle in the first Paper Mario and is cleared in a very similar fashion (requiring Vivian instead of Bow). A Bandit and a pink Bob-omb in Herb T.'s cola bar. A Black Chest Demon who gives Mario the plane ability. Additional items are on sale at the Deepdown Depot as well as dropped by enemies. Black Key In the east of sublevel 3, it is on a ledge by the left of the stairs. Damage Dodge In the east of sublevel 3, it is on the northwest platform in the Punio room. Accessible from the passage Punio made available. Defend Plus In the room to the right of the river on sublevel 2, it is on the northeast platform. Defend Plus P In the east of sublevel 1, it is in a chest in a highest place just before the sea room. Accessible from the next room. Fire Flower In the east of sublevel 2, it is in the left question block on the ground. Flower Saver P In the west of sublevel 1, it is inside a chest to the left of the X sign on the southwest ground. Requires a Spring Jump. FP Plus In the warp area on sublevel 2, it is in the chest near the pipe to Chapter 6. Gradual Syrup In the west of sublevel 2, it is in the right question block on the ground. Happy Heart P In the east of sublevel 3, it is in a chest hidden behind a piece of paper underneath the stairs. Have Flurrie to blow it up first. Mushroom In the east of sublevel 2, it is in the right question block on the ground. Pretty Lucky In the east of sublevel 3, it is in the invisible block by the south wall. Shine Sprite In the west of sublevel 1, it is on the westernmost platform, near the pipe to the background. In the center city on sublevel 1, do a Spring Jump near the thin pipe to the north of the up-down platform, and go right to find it. In the east of sublevel 1, it is on the south platform beyond the sea. In the center area on sublevel 2, it is next to the pipe to Petalburg. In the east of sublevel 2, it is in the secret room to the right of the river. In the east of sublevel 2, it is high in the secret room to the right of the river. In the center room on sublevel 3, it is on top of the west ledge with an airplane panel. Silver Card At the entrance of the Pit of 100 Trials, it is given by Pine T. Jr. for doing his trouble. Slow Shroom In the west of sublevel 2, it is in the left question block on the ground. Soft Stomp In the center city of sublevel 1, it is inside a chest in the left of the south water. Spike Shield In the east of sublevel 2, it is in a chest guarded in the spike room behind the cells on the ground. Star Piece In the center city on sublevel 1, it is behind the broken pillars in the southeast. In the center city on sublevel 1, it is behind the column to the right of the buildings. In the center city on sublevel 1, it is behind the column to the left of the buildings. In the center city on sublevel 1, it is by the front side of the table in Wonky's house. In the east of sublevel 1, it is under a panel at the center of the first sunken area. In the east of sublevel 1, it is on the hammock in a house beyond the sea. Accessible by Spring Jump pipe in the north of the sea. In the west of sublevel 1, it is on the last platform in the background. In the west of sublevel 1, it is on the ground, behind the L-shaped platform. In the center room on sublevel 3, it is under a panel in the south. In the west of sublevel 3, it is behind the stairs to the right. In the east of sublevel 3, it is behind the big yellow block, in front of the turning corner of the pipe. In the east of sublevel 3, it is under a panel in front of the pipe to Chapter 2. In the east of sublevel 3, it is under a panel in front of the black chest. Pretty Lucky Badge In the area with the Puni hole, on the opposite side from the hole itself, Mario should jump to reveal the hidden ? Block. The location of this block is mentioned in Wonky's Tales, "What's Hidden Below". We're down below Rogueport. The current town was built on top of this ancient one. Pretty surprising to find all this down here, right? It kinda blows my mind... The ruins here are all crumbly and gnarly now, but it was once a great town, really. We're down below Rogueport. Folks say these are the ruins of a 1,000-year-old town. Even though these buildings are crumbling, some seem safer than those above us. The people living here mostly can't show their faces above for one reason or another. Some have actually started successful businesses here, though! What a hardy bunch! We're down below Rogueport. Y'know, this seems to be more than just a corridor... Nothing's ever what it seems down here, huh? There's a black box in the middle of the room. Y'know, in case you missed it. And, um... Yeah, there's just not much else, really. Looks like some seawater's found its way in here, huh? Yeah, that's a health hazard. I bet some weird sea things live in there, too... so try not to fall in the water, OK? Oh! There's a pipe here that connects to Petal Meadows. This is Merlee the charmer's house. With her charms, you get random bonuses in battle. It costs a few coins, but I hear it's totally worth it. These spikes seem to rise and drop according to a set pattern... They must be here to keep out thieves, huh? Now THAT'S a security system! With good timing, if you ran while the spikes were down... you'd still be a shish kebab. That's the entrance to the Pit of 100 Trials. No one knows how far down that pipe goes, but... it keeps me awake at night. We're down below Rogueport. You could spend a lifetime studying secrets down here. We're down below Rogueport. This corridor connects to the area above. Nice, huh? By the way, you know you can pass through iron bars in Paper Mode, right? This is just another part of the underground corridor. I bet tons of people passed through here a thousand years ago. Coooooooool. We're down below Rogueport. I never knew this room was connected like this... If you see a similar entrance in another area, you should totally check it out. We're down below Rogueport. There's a pipe here that connects to Twilight Town! This is the house of the level adjuster, Chet Rippo. Whenever you want to adjust your levels or your partners' ranks, just come here, OK? Seriously, though, how many customers do you think he gets, living down here? Another room in here, huh? Wow. But what's the significance of it? An undiscovered chamber of purpose unknown... THIS is why I love archeology! We're down below Rogueport. There's nobody here. Huh! I wonder where they went? The in-game map description of Rogueport Sewers reads, "The ruins of an ancient town remain intact underground, and deep within them is the legendary Thousand-Year Door. Holding the Magical Map aloft before that door will lead to the Crystal Stars." This page was last edited on April 9, 2019, at 08:35.